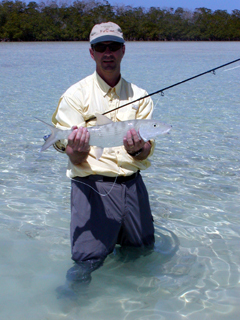 The Bahamas is reknown for bonefishing offering the most beautiful & productive bonefish flats you'll ever find. 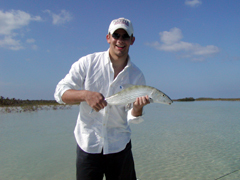 Below you will find information on our Mothership Bonefish Charters. We have become known for our exotic long range trips, and now we are pleased to be able to offer a true Bonefish Mothership in the Bahamas. We have two distinct options available, which take advantage of the many different capabilities we have at Over Under. Using one of our largest Sport Fish Yachts as our base, allows us to offer a mix of both inshore and offshore fishing. 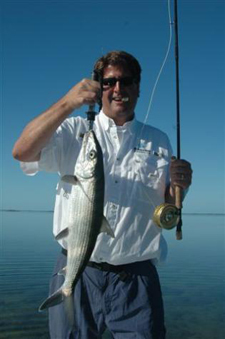 We are not aware of any other Mothership bonefish operation which provides for a quality offshore experience, while not sacrificing bonefishing capabilities. 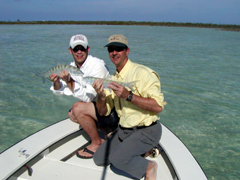 Our second option is a true bonefish trip, no offshore option. This second option has been made available due to the recent joint venture between Over Under and Great Harbour Trawlers. 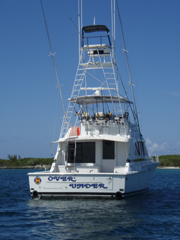 In 2009, a brand new N47 Great Harbour Trawler is available for crewed mothership bonefish charters. In 2009 our base trips will be run out of Marsh Harbour. From Marsh Harbour we have so many wonderful options as to our projected itinerary. As always the actual itinerary will be based on both weather, current fishing conditions, and our customers' desired fishing experience. Trip is for up to four anglers, no more. Two anglers can be guided at any given time. The other two are able to wade, or light tackle fish. Bluewater fishing is available, as requested. Both 19' Skiffs are available to transport anglers from the Mothership to the fishing grounds. Board the Bahamas Mothership at Marsh Harbour at 2:00pm on Saturday. Boat will return to Marsh Harbour by 9:00am the following Saturday. Six Days Fishing. This is a fully guided trip for up to 4 anglers. Two additional non-fishing companions can be accomodated at an extra charge.